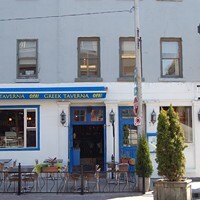 There are those who will stop in just to enjoy the mezethes, or the appetizers, both hot and cold, including the popular spanakopita, house-made sausage loukaniko (pork and beef marinated in wine and flavoured with exotic Mediterranean spices). But the starters are only part of the story, as co-owner and restaurateur Costa Elles takes pride in every dish. And after years of success at the corner of Blowers and Argyle, Opa has been exported to Bayers Lake, bringing a welcome breath of Greek sophistication to the big box area.